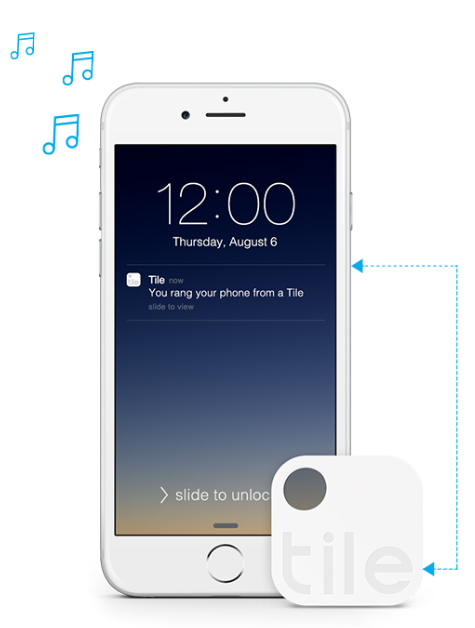 Never misplace your keys or phone again with the help of Tile. Losing everyday objects is a common occurrence. Misplacing your keys, phone, or wallet happens to all of us at least once. While we used to spend countless hours attempting to locate and remember where we left our lost items, Tile allows us to find those same items in a matter of minutes. Tile is a small Bluetooth tracker which you can attach, stick, or place near any item and if that item were to become lost or misplaced, Tile would be able to find it. Tile works primarily through the Tile app on your smartphone, which is available to all Apple and Android users. For example, you lose or misplace your keys. If you have attached a Tile to your keys you will be able to find them by activating the Tile app on your smartphone and clicking on the “Find” button (see below). If the Tile is within 100 feet it will begin to play a loud tune until you are able to locate your keys. If your item is not within 100 feet of your location, you are able to expand your search using the Tile app. Any smartphone or device that has the Tile app running becomes a receiver so if a stranger were to pass by the area where your lost item is located, the Tile app on their phone would transmit a signal to the owner’s phone providing an up-to-date location on their lost item. It is important to note that while a stranger’s Tile app might locate your lost item they DO NOT receive the location of the item or have the ability to access the location. Tile can also help you find your phone if it has been misplaced. By double-pressing on your Tile, your phone will loudly ring, even if it is on silent, if you are in the 100 foot Bluetooth range. Outside of 100 feet, you can find your phone by logging onto Tile’s website to see its last known location, make it ring, or initiate the phone’s lock screen to prevent anyone from using it. In addition to being small and light-weight, Tile comes with a variety of features including water resistance, long-lasting (1 year) batteries, and a 90 decibel sound that’s easy to hear. The device is also cross-platform compatible between Apple and Android. You are able to locate your Android phone using an Apple iPad and vice versa. A single Tile currently costs $25 CDN and is available to order on Tile’s website. You also have the option of buying them in packs of 4, 8, and 12 at different costs for each pack. It is definitely an interesting and unique gift this holiday season and one that might be worth trying out.